Bhagawan's mission is unstoppable. Whether you like it or not it moves as it has to. It is only our privilege to become members of that mission. Swami pulls different people from different walks of life into His mission and get His work done. One can not believe his own words how Swami performs great deeds. There are many such incidents to see in Parthi. Water Project or Hospital construction or the devotees coming here or the regular activities all clearly reveal that He is none other than God if one exists. In my previous episode I have narrated how Swami pulled a person called Sri Karunyananda to His divine fold. Here is another person who was brought to Bhagawan's fold for a cause. He is Dr. Keith Critchlow, director of Prince of Wales Institute of Architecture, London. He is instrumental in designing the Super Speciality Hospital in Puttaparthi. He narrated his own experience in one of the books I am referring. I present the story in his own words. In 1984 a Swami devotee from India, came to my place, on her way to Indra Devi Ashram. She gave me some Vibhudhi and asked me to take. I took a small portion and forgot about that completely. When I was the principal of Royal College of Arts, Sir Isaac Tigrett came to my room. He introduced himself as Isaac Tigrett. I did not know who he was. My friend beckoned me that he was a great personality and asked me to treat him with respect. Knowing my predacament he further said I am the owner of Hard Rock café. I was further confused with this new name and said so what? Then he understood the ignorance and came to the point directly. There is a great and saintly person in India. He wants an architect for His super specialty hospital. Would like to design the entire hospital. I was glad to accept that as I was interested to see the places in India and meet the saints of India. I conveyed my willingness to him and said I am willing to come to any place as far as my wife can travel. So Tigrett organized tickets for both of us to India. Thus first time we went to India. First we went to Bangalore and from there we went to Prasanthi Nilayam. We went inside a place called Poornachandra Auditorium which, was like an aeroplane hanger. It was a big hall housing around 25,000 people. I never saw such big gathering there. I was embarrassed to know that I was the only person who is wearing color cloths as all the others wearing white cloths. The other person wearing color dress was only Baba Himself. He came straight to me and asked "so, you are the architect". As I am observant and educated, I understood the mannerisms I sat like all other people on the ground. The very next day Swami called us for interview. 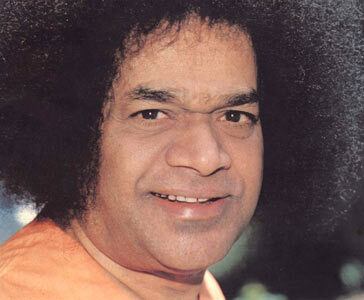 Swami can I call my wife also I queried Baba. On hearing on affirmative I called my wife. In the interview room all the gents sit on the right side and women sit on the left side. As we did not know all this we sat next to each other. Swami looked at us and in a low voice told you are now in India. Then we realized our mistake, I moved towards gents and my wife towards ladies. Now Swami looked at me and said come here. I went and sat near Him. Swami then asked what do you want. Thinking that it was similar to the conversation I had in London, I asked Swami do you want me to be your architect for the Hospital, I want to know. Swami brushed aside that and stared at me. Then He repeated the same question. I was melted for that affection and said I want to serve you as an architect. Till today I did not know why I said that. Though I am a scholar my ego subdued in His presence and I politely told that I want to be servant at His for. Then, Swami waived His hand in thin air and created a ring. As I had not expected that I was surprised. Swami brought that close to me and said what is there on the ring. I could not read that without spectacles. I said the same to Him. HE laughed at my embarrassment and said what is the use of an architect when you are unable to read. My ego further died down. In fact AUM was encrypted on that ring. Swami circulated that to everyone and took it. He now took it and blew on top that. This time this was disappeared and another ring appeared. This time there was a silver ring with Cross on top of that. I was happy to recognize that and said the same to Swami. Swami took that and again blew air on top of that. This time there was another ring in that place and that had star and crescent moon on top of that. Then I realized that God can do anything if He desires. Then He took myself and my wife inside the personal interview room and told about our personal life. Before I left that room Swami slithered that ring to my ring finger. The symbol on that changed to AUM again. I realized the meaning of that symbol changing. The place of my work The Royal collage of arts is an Islamic college. I read Islam and brought up as a Christian.